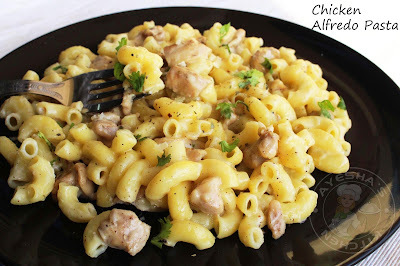 Here am with an absolutely yummy, quick weekend pasta recipe with white sauce. Chicken Alfredo pasta recipe is a creamy buttery mildly spiced pasta - for sure a yummy treat to make. This is an Italian pasta recipe. The alfredo sauce (white sauce for pasta ) used in this dish is a blend of butter, cheese and milk/cream. 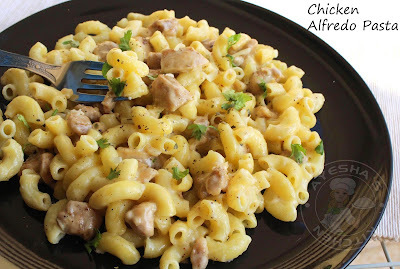 You can make your own alfredo sauce / white pasta sauce at home which can be used for several other dishes. Chicken Alfredo recipe, spaghetti with white sauce recipe are some of those dishes. 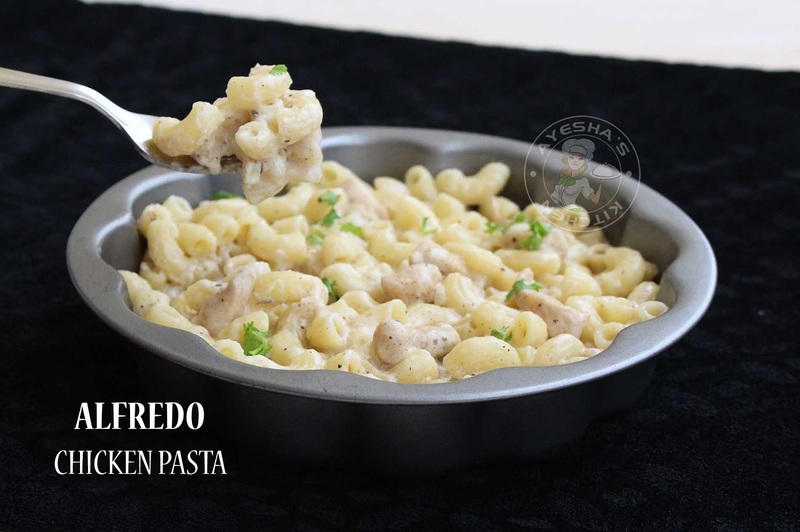 For those who crave for a creamy cheesy pasta recipe, here is your pasta alfredo recipe. Fettuccine Alfredo (ribbon pasta alfredo) is a pasta dish made from fettuccine tossed with cheese and butter. This is one of the oldest and simplest ways to prepare pasta. Its convenience attracted me to make this often for my kid. So I made the same with macaroni pasta. 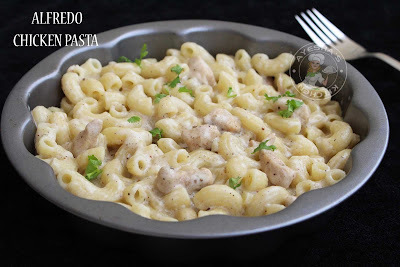 Here is the recipe showing how to make pasta with alfredo sauce / creamy chicken alfredo recipe /best fettuccine alfredo recipe / white sauce pasta/pasta white sauce recipe/Italian pasta recipes / easy Italian recipes. Cook the pasta in boiled water along with salt and little oil for about 8 - 10 minutes or as per the instructions that were given on the package. When done, drain the excess water and set aside in a colander. Meanwhile, Heat butter in a pan and toss the cubed chicken (season with salt and pepper powder) until done. Transfer it to plate and set aside. In the same pan add olive oil and saute the thinly chopped garlic until raw smell goes off over a low flame. Do not burn the garlic. When done, Make the flame very low and then add cream cheese and mozzarella cheese. Mix well. Cook till cheese is melted over a low flame. Now add milk along with pepper powder, garlic powder, and salt. Combine well until it thickens to a saucy consistency. Then add the cooked chicken and cooked pasta. Gently combine well and simmer for 3 minutes. Remove from fire and serve hot topped with some grated cheese, a pinch oregano, and parsley leaves. NOTE: you can add mushroom instead of chicken for veggies. Can add chicken stock too along with the cooked chicken for the best ever taste. Here I used a combination of mozzarella and cream cheese. Instead, you can add cream cheese alone.